"This recipe is very fast and easy. 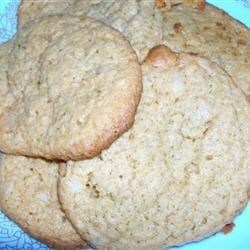 The white cake mix, butterscotch pudding, and sour cream make these cookies rich and unique, and the recipe takes only 5 minutes to make! My boyfriend loves them." In a large bowl, stir together cake mix, instant pudding, and rolled oats. Add oil, sour cream, water, and vanilla; mix until smooth and well blended. Stir in chocolate chips. Roll dough into 1 1/2 inch balls, and place 2 inches apart on the prepared cookie sheets. Way, way too sweet and doughy. Great recipe, i substituted Devil's Food Cake mix and Vanilla pudding. Also, instead of 1 cup of choc chips i did one cup mixed of choc chips, white chips and walnuts. My Husband loved them. These were so simple, and so very good! Since the recent egg scare, I've been looking for a cookie that was eggless. This one wins by a mile! Thank you for the excellent recipe!